During the cold and flu season, seniors may be vulnerable for contracting one of these common illnesses. 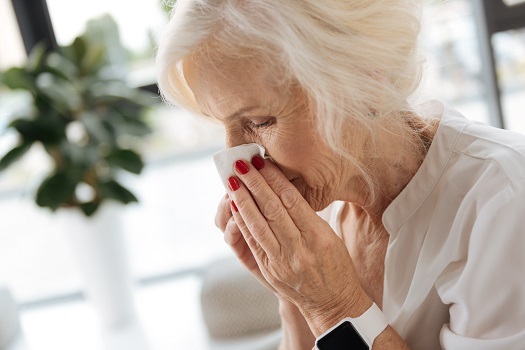 Due to advancing age, preexisting health conditions, and certain medications, older adults are much more susceptible to the common cold and flu than their younger counterparts. Here are five cold and flu prevention tips seniors should consider. Handwashing is the first line of defense when it comes to cold and flu prevention. Viral and bacterial microorganisms are found everywhere, including doorknobs and escalator rails. Shopping carts are special hotspots for bacteria. Advise your loved one to wipe off the shopping cart handle with antibacterial wipes when entering the grocery store. Antimicrobial wipes are readily available by the entrance and can reduce the risk of getting a cold or the flu. Seniors who want to remain healthy as they age can benefit in a variety of ways when they receive professional elder care. Winnipeg, MB, Home Care Assistance is here to help your loved one accomplish daily tasks, prevent illness, and focus on living a healthier and more fulfilling life. Offer your loved one citrus fruits such as oranges, tangerines, and grapefruit to boost his or her immunity. If your parent cannot tolerate citrus fruit because of acid reflux disease, spinach or broccoli are acceptable alternatives. Restorative sleep enhances immune function and lowers the risk for viral infections such as the cold or flu. As people age, their sleep habits can become erratic, sometimes leading to insomnia or early morning waking. To ensure your loved one gets enough recuperative sleep, encourage mild exercise and limit his or her caffeine intake. If your loved one has a preexisting medical condition that makes him or her susceptible to infections, wearing a facial mask can prevent colds and the flu. Facial masks are especially important when your parent is in a large crowd or in a cramped, crowded room. In addition to preventing the inhalation of airborne infectious droplets, facial masks may also prevent cold outdoor air from irritating the airway and nasal passages. Breathing in cold air may cause the nasal passages to become more susceptible to the effects of cold and flu viruses. Performing daily tasks while simultaneously managing the symptoms of a serious illness can be challenging for seniors. The Winnipeg live-in care experts at Home Care Assistance are available 24/7 to make sure your loved one has the care he or she needs to remain safe and comfortable while aging in place. Cigarette smoking can damage the small capillaries inside the nose, predisposing the nasal mucosa to the effects of infectious pathogens. Smoking may also lead to poor circulation, impaired blood flow, and a compromised immune system. If your loved one smokes, encourage him or her to quit or cut down. In the event he or she is unable to quit smoking without help, make an appointment with a physician who will recommend effective smoking cessation treatments such as nicotine gum or patches. The flu is just one of the many health issues older adults are susceptible to. There are a variety of age-related health conditions that can make it more challenging for seniors to live independently. However, many of the challenges they face can be easier to manage if their families opt for professional home care. Winnipeg families can rely on expertly trained caregivers to keep their loved ones safe and comfortable while aging in place. To hire a professionally trained caregiver for your parent, call Home Care Assistance at (204) 819 0392 today.